Jessica and Keith had their wedding at the beautiful Elliston Vineyards in Sunol, CA. The hallmark of this amazing wedding venue is the old stone mansion which was built at the end of the eighteenth century and brought back to it's current glory in the late 1960's. Before the wedding started I sought out to establish an indoor portrait which showcases the historic charm of the house. 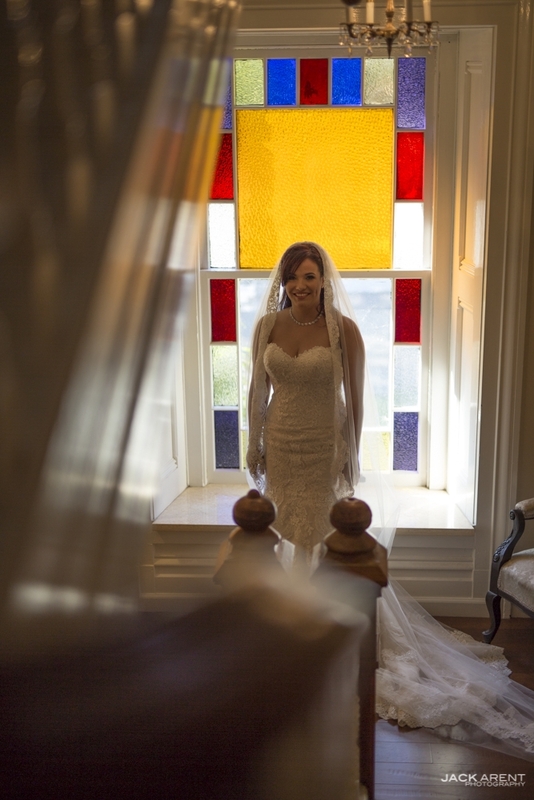 Since Jessica and Keith reserved their first look for the wedding I placed the bride in front of the stained glass window on the second floor, and the groom in the wine tasting room on the first floor. After the dramatic portraits were complete there was still a few minutes of downtime before the wedding so Keith and his groomsmen made the best of it. I honestly can say this is one of my top five wedding venues, from a photographer's perspective it's a breeze for any bride and groom because all of the formal photo locations are all within a few steps of each other. I enjoyed photographing these two, I kept assuring the couple that we would be done with formal portraits in a short while (because it was just a few degrees shy of 100) and Keith kept assuring me they were fine and they just wanted me to make them look great. They were troopers during the heat wave and their patience paid off. Sometimes we shoot natural light and sometimes we use strobes like in the below portrait with the stone mansion in the background. Some dance during the formal reception entrance and others make it rain! There's a string of at least a dozen highly emotional photos during the mother son dance, believe me it was fun to look back at again during the retouching process. No lie, the people who caught the garter and bouquet are dating each other! This was a fun bunch of friends and family and they really let loose on the dance floor. I love this part of a wedding, my trusty team handles the dance floor photos while I go outside to set up lighting for an evening portrait. This is a two photo composite which turns into a single image, which would look great as a big canvas print! Elliston Vineyards is one of the few wedding venues where you can actually have a sparkler send off.